In Memoriam commemorates Henrik Hellstenius’s relationship with his father, to whose memory the piece is dedicated. But it also marks his ongoing creative relationship with Peter Herresthal, an association of mutual musical inspiration in which both composer and violinist have catalysed each other’s imaginations, a partnership that has already produced a catalogue of pieces that push the limits of violinistic possibility. 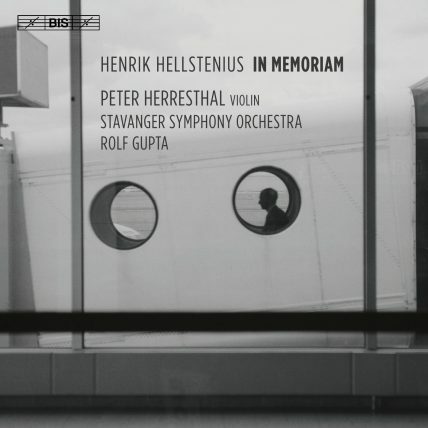 Nevertheless, In Memoriam, the second of Hellstenius’s violin concertos, and the second written for Herresthal, creates its own distinct musical consciousness, in a sound world of vivid but liminal beauty, of fragile yet elemental extremes of dynamic, register, and expression. And consciousness, or rather a fragmentation of it, is at the heart of the work’s personal inspiration for Hellstenius, and is even thematised in the fabric of the concerto, which is scored for strings and percussion. Hellstenius’s father Erik died of Alzheimer’s disease, with the dissolution of consciousness that terrible condition produces. But for Hellstenius, these ideas aren’t turned into programmatic representation. Rather they provide the basis for a composition whose formal and structural ideas simultaneously carry those distinct ideas of fragmentation and continuity, of gesture and line, of sonic rupture and searing melodic intensity. That contrast between different states of sound and being is embodied right at the start of the concerto, when Herresthal’s violin line veers from a static, highregister, colourless pitch to material that traverses the boundary between noise and articulated sound: sonic objects of harmonics, quarter-tones, and sul ponticello tremolos, or marked ‘ricochet’, with Herresthal’s bow bouncing across the instrument producing the effect of a sound being shivered into being. That sound world is amplified by the orchestral string parts, which function like a chamber of warped musical memories and premonitions. It’s a language of visceral ethereality that this recording captures in forensic detail, and it’s also an idiom designed for Herresthal’s exploratory musicianship. Herresthal says that he asked Hellstenius to make this second concerto ‘more virtuosic’ than the first (By The Faint Voice A Light Is Shed contains much music of deep, slow concentration) – and it is, in terms of the sheer technical control and precision that the solo part demands. But this is the opposite of a virtuosity of display or extrovert energy. ‘Henrik never wants things to sound traditional’, Herresthal says, ‘he wants to avoid all kinds of showing-off, and he never wants to paint an old picture again, instead finding new sounds’. The solo part demands a virtuosity of intimacy (that’s true even in the cadenza, about threequarters of the way through the piece) and of architectural and emotional control. The lamenting, falling melodies that are the lyrical antipode of the violinist’s ricochets and tremolos are oases of musical utterance, moments when the soloist finds moments of clarity and consciousness. And yet the whole concerto’s trajectory –and despite the multi-layered fragmentation of this music, there is a mysterious cumulative momentum that the piece builds, thanks partly to the ritualistic marking of time in the percussion writing, a tolling litany of bells and drums – ends not with an image of consciousness claimed, but rather of indelible lament. Herresthal describes the last few minutes as being the work’s most obviously grief-laden: ‘You can imagine that this music could have been played at the funeral’, and respondingto its expressive directness, he even talks about it as ‘almost like modern Chopin – it’s very beautiful. It’s very deep, very moving’. Hellstenius revised In Memoriam after its first performance in 2012, changing what was an expressionistic outburst of ferocious energy in the music before the soloist’s cadenza to something much stranger: a black hole of musical stasis, underscored by a dark percussive pealing. Hellstenius’s compulsion to revise his pieces is even more pronounced in his orchestral work Like Objects in a Dark Room. He says he has reworked this piece ‘maybe four times’ since 2007, always striving to make the best version of it possible; the latest version was made last year. Hellstenius says that ‘some of the objects in the piece are clearly inspired by other composers: there’s an inspiration from Sciarrino in the rhythmical string tremolo [Sciarrino is also an influence on some of the gossamer-fine violin writing of In Memoriam], and the snare drum idea is clearly inspired by Bernd Alois Zimmermann, one of his beautiful pieces that is very seldom performed, Stille und Umkehr’. But what you will hear in these ten minutes – a span of clock time seemingly contra dicted when you listen to the work, since it creates an experience that seems vaster in scope and scale and space – is a spiralling sonic sculpture is something that is distinctly Hellstenius’s own. He also speaks of Luigi Nono as an influence – ‘his language, especially in his later pieces, is really crystal clear and very condensed’, he says – and yet Like Objects in a Dark Room is far from compositional homage. ‘I tried to be naked in this piece. I tried to do as little as I could, in a way. In fact both of the works on this recording are trying to do things that are fragile but which also have forward motion, but all done without trying to dress up too much’. Like Objects in a Dark Room is about the exposure of its sonic ideas in as concise form as possible, but it amounts to a heightened experience: a merry-go-round it may be, but this a musical carousel of existential ideas.